Vegetarian soup made with fresh vegetables. A delicious, hearty vegetarian soup, loaded with fresh vegetables and herbs. Seasoned with curry and cumin in true Mediterranean tradition. Ingredients: Lentils, potatoes, carrots, celery, onions, salt, soybean oil, herbs & spices, citric acid. Serving Instructions: Keep frozen. Thaw and combine condensed soup with equal amount of water. Heat & serve. 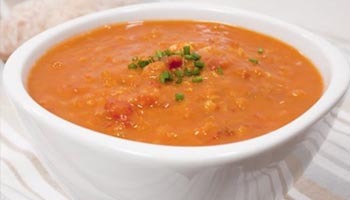 Bring Lentil Soup to your restaurant today. Contact us or download a spec sheet to learn more. Copyright © 2019 Global Food Services, Inc. All rights reserved.